All visitors must hold a passport valid for at least 9 months. Visa-free nationalities: Mozambique (30 days), Namibia (90 days), South Africa (30 days per visit with a maximum total stay of 90 days per year without visa). 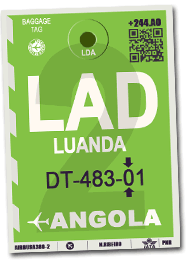 Transit: Passengers arriving at Luanda Airport in transit to another airport outside Angola do not need a visa provided they do not leave the airport. Special passports: holders of diplomatic passports or service passports of Algeria, Argentina, Brazil, Cape Verde, China, Cuba, Egypt, France, Guinea-Bissau, Italy, Mozambique, Portugal, Russia, Sao Tome and Principe, South Africa, South Korea, Switzerland, Viet Nam and Zambia are exempt from visa requirements for stays of up to 90 days . 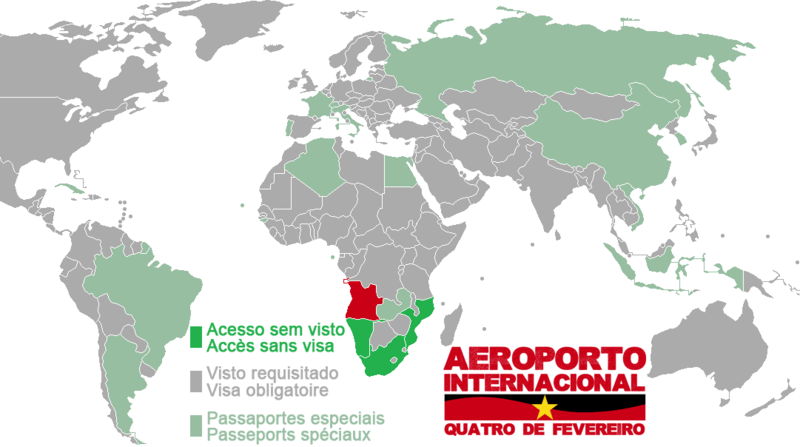 Nationalities needing a visa: nationals of all other countries must obtain their visas in the embassies and consulates of Angola. Note: a passenger who does not have Angolan identity papers (passport or identity card) is considered as a foreign passenger even if he / she has a multi-citizenship and must therefore be in possession of a visa . Conditions: You must have a passport valid for at least 9 months and contain at least two empty pages. Standard procedure in embassies: If you are not eligible for one of the visa exemptions detailed above or if you wish to obtain a longer visa or visa for a reason other than a family or tourism stay you can go to the nearest Angolan diplomatic representation (see the addresses and contact details of the embassies and consulates of the Republic of Angola). * Updated to January 6th 2018. Conditions for obtaining visas, their rates and the nationalities concerned change regularly according to the diplomatic news. Please check systematically what formalities you are subject to.